This is used to any Door or Gate to Detect Any human person or any animal pass across gate. When Any Crosses the gate then Automatic alarm beeped for some duration and then after automatic stopped. So even any person or gateman or guard is not available at door, no any can entered through gate secerately. This is IR based Security Alarm. This circuit can be used at any door at there are no any gatekeeper or any guard available. 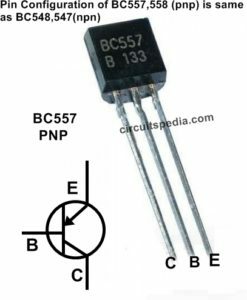 This circuit Detect any entry through Gate by using the method of interruption or obstraction of Light. The light of infrared LED is not visible by human eye so this operation is invisible. 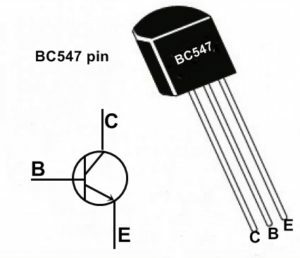 IR LED is placed at one side of gate and in the straight way of this LED a Photodiode is placed in this front as light directly incident on photodiode. • Use 2 or More IR LED with seprate Resistor on each in Parallel For More Range. • Photodiode should be Covered With Black Tape Or Any Non transparent Material, Because Photodiode Detects Environmental IR Rays Which Emitted From Sun and Then May be Malfunction. Sun is The Largest IR Emitter. This is the circuit diagram of Gate Security Alarm. When any person Want to cross the door then light incident breaked through person and then buzzer beeped for a duration of some second or minute. Duration of buzzer sound can be adjusted . Here 555 timer IC is connected in MONOSTABLE mode and which duration of output is set for a fix time. Here A comparator IC 358 is used. Non-inverting (PIN3) of voltage comparator is connected to the Photodiode and inverting (PIN 2) of voltage comparator is connected to a variable resistor of 5k. Output of the voltage comparator (PIN1) is fed to the Trigger pin of 555 timer. 555 Timer is configured in monostable mode here. 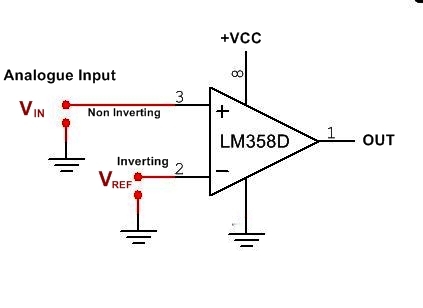 Here IC LM358 Uses as comparator. A comparator circuit compares two voltages and outputs either a 1 (the voltage at the - (negative) or a 0 (the voltage at the + side) to indicate which is larger. The Op-amp comparator compares one analogue voltage level with another analogue voltage level, or reference voltage ( VREF ) and produces an output signal based on this voltage comparison. In other words, the op-amp voltage comparator compares the magnitudes of two voltage inputs and determines which is the largest of the two. Comparators are often used to check whether an input has reached some predetermined value. In most cases a comparator is implemented using a dedicated comparator IC, but op-amps may be used as an alternative. Comparator diagrams and op-amp diagrams use the same symbols. 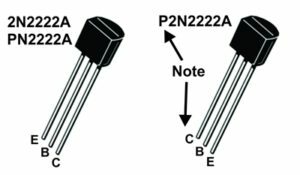 When the radiation of IR LED is falling on Photodiode, the voltage at the Non-Inverting Pin 3 (+) of voltage comparator is higher than the inverting Pin(-) and the output of the comparator is HIGH. The output of comparator is connected to the trigger PIN (pin2) of the 555 timer, When output(pin1) of Comparator is high , Trigger pin 2 is high. When Voltage at the trigger Pin of 555 is HIGH then the Its output is low. 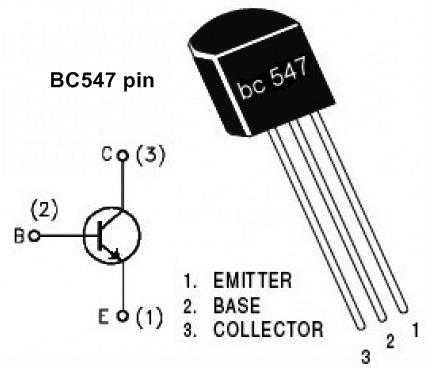 So during the period when the IR rays falls on Photodiode, the 555 timer output remains LOW. when there is some movement, the falling of IR rays on Photodiode gets interrupted and the voltage at inverting end (Threshold voltage) of voltage comparator becomes higher than non-inverting end, for some moment. This makes the output of comparator LOW and also makes the Trigger PIN 2 of 555 timer LOW. This will trigger the 555 timer, and 555 timer’s OUTPUT goes HIGH and Buzzer beeps for short duration. Duration of the beep can be increased by changing the value of resistor R1 or capacitor C1 (RC network in monostable mode of 555 timer IC). The sensitivity of the sensor can be changed by variable resistor RV1. IR LED and Photodiode must be fixed in straight way to IR rays can directly falls on photodiode.